A constant smile, a positive attitude, and a willingness to go above and beyond are just a few of the characteristics that nominators praised about Fotios “Fody” Frentsos ’84. Frentsos received the third annual Special Thanks and Recognition (STAR) Award from the University Staff Council at a Jan. 11 luncheon. The peer-nominated award honors non-faculty employees who go above and beyond their job description, offering encouragement, a positive attitude, and an efficient work ethic to the campus community. Frentsos is known as the “lifeline” of the Athletics Department, which includes being a trusted and sought-out mentor to students, especially athletes, although his actual title is coordinator of athletic facilities and equipment and he’s also the hitting coach for the baseball team. Whether it be a student struggling with academics or life at home, Frentsos’ door is open. 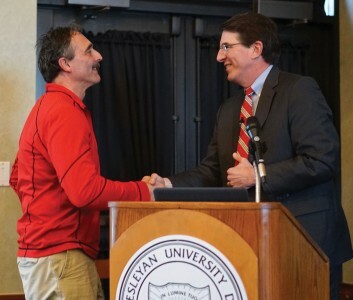 “He exemplifies what is great about Ohio Wesleyan,” said Mike DeWitt, head men’s basketball coach. Frentsos was a standout athlete as a student, earning nine letters in three sports. He served as an assistant football coach for 11 seasons, then transitioned to baseball full-time to be able to spend more time with his family, including his wife Kelly Maxwell Frentsos ’86 and their six children. Visit the alumni Facebook page to read more accolades for Fody or share your own. Last year’s STAR winner was Cole Hatcher, director of media and community relations, who has been with the University for 12 years and was recognized for his quick, creative, and dedicated work.